"One of my favourite holiday treats is to pour a shot of Calvados into a still-warm cup drained of coffee. This heady example from the Dupont family, the product of hand-harvested apples, is pale yet golden, rich on the nose and pleasantly biting on the finish." Refreshing and aromatic, round, this modern cider achieves a beautiful symbiosis, while keeping its originality with hints of liquorice and honey, and a controlled bitterness. Six months' ageing in Calvados casks creates an extraordinary nose that's full of barnyard funk, apple and citrus, with a palate that's beguilingly delicate. This cider is a judicious blend of bittersweet and acid apples manually sorted, fermented with indigenous yeasts, matured in calvados casks and is unpasteurized. Fine bubbles, spicy and fruity on apple, pear, citrus and pineapple: a gourmet cider ideal as an aperitif. "An Apple Brandy a Day Keeps the Winter Blues Away"
This golden brandy is scented with rich vanilla and honey, plus a surprising herbaceous lilt. The bold flavor has a savory, almost meaty note at first sip, but finishes with more delicate freshness, fading into honey, white flowers and vanilla. This complex, distinctive sipper is worth getting to know. This contest is organised in Hong Kong with a 100% Asian jury, chaired by Mr Nelson Chow, president of the Hong Kong and China Sommeliers Association. "This small package contains a glorious, finessed Calvados. I always forget how much I love the smell of baked apples and brandy until a bottle like this is opened. Pure pleasure. Put under the tree for yourself and drink on Christmas Eve." "In Normandy, Young Ambition Stirs a Traditional Brandy"
In its Holiday 2013 issue, the LCBO Food and Drink magazine has a feature on French Brandy. The magazine has selected a Domaine Dupont Calvados to illustrate the article. "Domaine Dupont VSOP Pays d'Auge Calvados is double distilled and aged for a minimum of four years. Intense and complex, it has aromas of apple, citrus and vanilla that become more pronounced if you add a drop or two of water to each glass." This contest was held during the Singapore Beerfest Asia 2013. This is an award given for the best beer or cider produce you can find in Singapore. Visual aspect: beautiful gold colour, gleaming old gold hue. Nose: complex, very fine, elegant, subtle. Beautiful typicity. Delicious nose. Fresh ceps, white-fleshed fruits, peach, mango, fresh Granny Smith. Palate: beautiful typicity. Exceptional fineness. Melted and very long palate. The apple is delicate, melted and swirls delicately. Gourmet pairing: roasted lobster on a bed of roasted and singed shallots. Comments: the Rolls of Calvados. A delicacy. Visual aspect: golden gleaming, deep. Nose: roasted apples, fig, cinnamon. Palate: dense fruitiness, melted palate; natural, classy, fine. Beautiful persistency. Gourmet pairing: crayfish with angelica and vanilla. Comments: a Calvados that is pleasantly concentrated. This contest is organised in Hong Kong with a 100% Asian jury, chaired by Mr Nelson Chow, president of the Hong Kong Sommeliers Association. In an article titled Outstanding Calvados, the french weekly Le Point presents 8 top-range Calvados. They have chosen to illustrate the article with a Domaine Dupont photograph and the "+30 years unredured" ranks second. "Powerful on the nose, elegant, rich, candied apple, floral notes, soft spices, round and full-flavoured on the palate, milk caramel, great finesse, very persistent cigar box." "While wasabi lovers will prefer an extra dry, sparkling cider to cut the heat, French cider—such as our beloved Etienne Dupont Cidre Bouché Brut de Normandie—works wonders with everything from tobiko to tuna rolls. The slight sweetness and earthy character will enhance umami." "Upon arriving (at Domaine Dupont) I’m invited to taste an impressive range of Calvados. The oldest dates to 1969. I particularly admire those aged about 20 years: The perfume of apples remains profound. Very old Calvados, while sublime, tends to taste the same as brandies made from grapes. I also sample the 2009 Cidre Bouché - fizzy cider - which I declare the best I’ve had in Normandy, exquisitely complex, earthy, and deep, with a hint of goût de terroir, like that found in a fine red Burgundy." Read the article "A Normandy Invasion"
"First among my favourites is the Etienne Dupont Cidre Bouché, which I've been buying for years. Like many of the top ciders, this comes in a wine-size bottle, topped with a cork. The Dupont is always vintage dated, and the ciders clearly differ from year to year. The 2009, which is currently on shelves, is not as intense as some previous years, but it is dry and deliciously pure, with maybe a hint of caramel to it." "A Calvados that is both powerful and fresh. A feast of aromas"
"Etienne Dupont has learned how to distil in Cognac. He prefers a rapid “coulage” to a rapid distillation, to keep the eau-de-vie lively and fresh. The 1977 is the perfect illustration of this especially considering that it aged in large casks which only just gave the faintest hint of wood to the distillate. This Calvados is a rarity in that it is neither diluted nor filtered, which is why it gives sensations of power and vigour. It combines with buttered apple citrus flavours and spice. When aerated the mouth reminds one of pastries. As for the empty glass, it’s a feast of aromas." "My favorite affordable Calvados is probably Domaine Dupont Calvados Fine Reserve, aged a minimum of three years, with an irresistibly freash aroma, an intense apple taste and a buttery finish." "Old sauternes / yellow-gold color; sediment-free clarity. Smells first of marginaly sour apple and is light, pleasing tart, and slightly spiced; the sour apple turns a bit riper following further air contact and becomes more like apple strudel / apple pastry than fresh apples; a good bouquet. Palate entry is smooth, sweet/sour, astringent and keenly apple like; midpalate highlight the apple peel nearly as much as the apple pulp and is now gently sweet. Composed, slightly sweet, and delicate in the finish. A very charming and evolve Fine Calvados that is contstantly growing and expanding with time. Genuinely lovely." "Amber/ burnished gold / maize color; excellent purity. Offers moderately toasted / baked aromas of baked apple, lemon peel, and oak resins; top-drawer notes of apple butter and apple sauce dominate the second stage of sniffing which aromatically carries the essence of aple from start to finish. Palate entry is delightfuly spiced (vanilla, nutmeg) like spiced apple fresh out of the oven; midpalate showcases the baked spiced apple theme to the max, making the taste profile zesty, ripe, fruity / citrusy, and pastry-like. Finshes with an added dash of spice and oiliness (buttery-type oil). Luscious, period." "It was one of my favorite ciders, a 2007 Brut de Normandie Cidre Bouché from Etienne Dupont, a great producer from Calvados country who sells his unfiltered, unpasteurized ciders in cork-topped 750-milliliter bottles, which are generally under $10. The cider had just a touch of welcome funk to it, a bit of a wet wool aroma that I felt contributed complexity, and while the cider tasted dry because it was so well balanced, it also had a bit of apple-like sweetness to it — a kabinett cider! I thought with its combination of kabinett sweetness and Champagne bubbles, it went perfectly with the Indian food. And only 5.5 percent alcohol." In the article on ciders and perries by Raoul Salama, the Domaine Dupont came first with an overall mark of 19/20 for the Estate. Givre is also mentioned in the section on Canadian ice ciders as being the only blend of this type in France. "The first cider sampled was the Cidre Organic Etienne Dupont. Organic and unfiltered, it reminded me of Belgium ale with its earthy, tart flavors. The nose is powerful and complex with a nice balance between bitterness and acidity. This could go with many other dishes besides Indian food. " "The next bottle is decidedly different. The Cidre Bouché seems to have a little more carbonation and definitely less yeast. Consider this a “user friendly” cider if you get my drift, with a little more acid and a cleaner finish. Both of these ciders are about four percent alcohol, so one or two at lunch won’t kill you. Again, this one could pair with many food items, but now I am going for dessert with a warm slice of apple pie and melted cheddar cheese." "My taste buds really perked up with the next cider, their Cidre Reserve. After fermentation, this cider is transferred into barrels containing Calvados that have just been emptied. It will slowly continue fermenting and maturing for six months. This process gives the cider much more complexity and a touch more alcohol, bringing it to 7.5 percent. I’ll just drink this by itself, thank you." "Now for my favorite: the Cuvee Colette. This cider is put through a secondary fermentation, like Champagne called Méthode Champenoise. I won’t go into this right now, but if you like sparking wine, you will most likely enjoy this cider. It is clean and crisp, with a little more acid than I expected. Delicate and fresh, it would be excellent compliment to a soft cheese such as Camembert or Pierre Robert." Le Point - France - November 2009. Calvados Reserve: "Apple, very tasty in the mouth, fresh, harmonious, spicy with white pepper, tonic." Marked: 15.5/20 (best mark for Calvados of this age). Cidre Reserve : "Strong in alcohol, powerful and refined, its powerful flavours heightened by being barrel aged will be a marvel with white meat, such as a veal blanquette, and also with a Normandy raw milk cheese." Givre : "Rare, this ice cider delights all the senses, the eyes with its amber colour, the nose with its aromas of salt butter toffee, and the taste buds with its sweetness and aromas of Tart Tatin." "Etienne Dupont has been able to give a unique character to his Calvados: power allied with an astonishing freshness." Calvados Reserve 45% : "Right from the beginning, the nose shows fresh hints of green apples, angelica and mint. In the mouth, the balance is perfect. A delight served with a creamy Camembert." Calvados 1977 45% : "Distilled in a small alembic, aged in 1200 litre (264 imperial gallon) casks, this Calvados has kept an astonishing vigour. Neither diluted nor cold filtered, it gives off out hints of crystallised fruits (citrus and quince) with an explosion of spices in the mouth. Complex, it has hints reminiscent of pastries. Splendid." Calvados 1969 41% : "The nose confirms its age with definite signs of “rancio”: undergrowth (moss, mushroom and humus), animal hints: “sweaty saddle” and game. The mouth is powerful and fresh. In the finish, licorice and hints of toast (and a hint of pain d’épices in the emptied glass. This truly is a great eau-de-vie." "This dry cider is well worth discovering, with its fine firm mousse: Cuvee Colette has aromas of sharp green apples and citrus fruits. Wonderful with prawns, “Normandy style” veal chops, apple with black pudding Tatin or a delicate cheese." Cidre Bouché : "Its colour is gold and amber. Aromas of sweet apples and exceptional freshness. This is a very good alternative to wine. It contains little alcohol, only 5%. This cider has quite a fine structure with a slight suggestion of bitterness. It would be an excellent companion to a poultry liver terrine, or as an aperitif." Cidre Reserve 2004 : "An elegant cider, mature (because it is aged in Calvados barrels) with dominant aromas of apple together with hints of lemon and orange. In the mouth, the attack shows flavours of apples, orange, licorice and hints of vanilla. This cider has acquired a fine structure thanks to its sojourn in barrels, and can be served at table. Serve with foie gras and apple chutney." 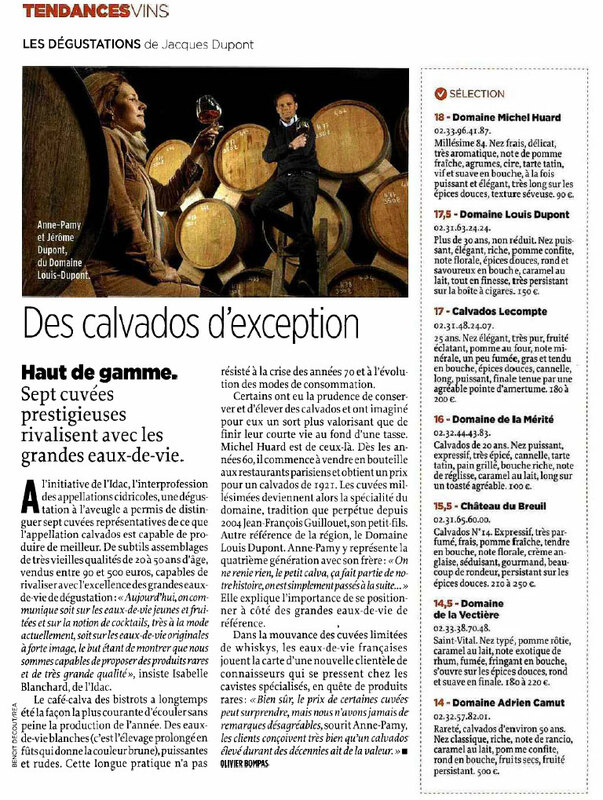 In its article “A journey to the heart of Calvados”, the German magazine “Drinks” awards the Domaine Dupont an important amount of space. In its article “Voyage en Normandie” the Japanese language version of Harper’s Bazaar gives pride of place to the Domaine Dupont.